Legend has it that the date palm tree, which bears the date fruits, was made from the dust left after the creation of Adam. Also referred to as the “Tree of Life” in the Bible, the date palm is one of the oldest cultivations of mankind. The sweet, luscious dates derived from the tree are not just a tasty treat to snack on but are also loaded with numerous health benefits. They are truly a food for your mind, body, and soul. Dates are a healthy source of essential minerals like potassium, iron, magnesium, manganese, and copper. They also contain vitamin B6, folate, niacin, dietary fiber, and protein. Including dates in your diet can help bolster brain functioning, support bone health, improve sexual wellness and help maintain a healthy heart. Dates are also high in sugar, which makes them ideal for an instant energy boost. It is for this reason that Muslims around the world break their Ramadan fast by consuming dates in order to quickly normalize their blood glucose level after fasting for an entire day. Apart from simply munching on them, dates can be used to make decadent date squares, cookies or energy bars. Plus, they can be added to salads and savory dishes. However, you may not end up using all the dates at once and may want to store the lot for future use. You’ll be happy to know that dates are fairly hassle-free when it comes to storage. They can either be stored at room temperature for several weeks or refrigerated or frozen for years. If you wish to “Save the Date,” then follow one of these three easy-peasy methods to store dates the right way. 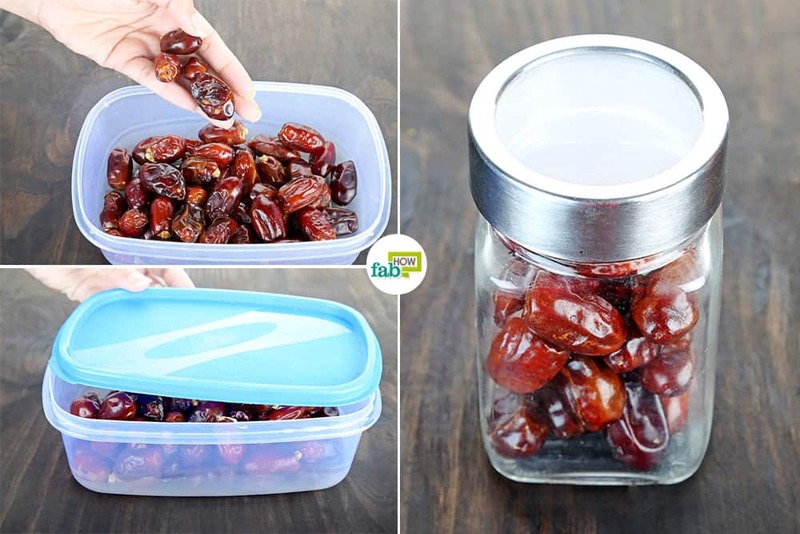 If you plan to eat your dates soon, then simply storing them in an airtight plastic or glass container will keep them good for about 1 month. However, because the semi-dry variety of dates are already cured and have been on the shelf for a while before you bought them, it is best to consume them within 1 week to get the best flavor. Even after a week, the dates won’t spoil. 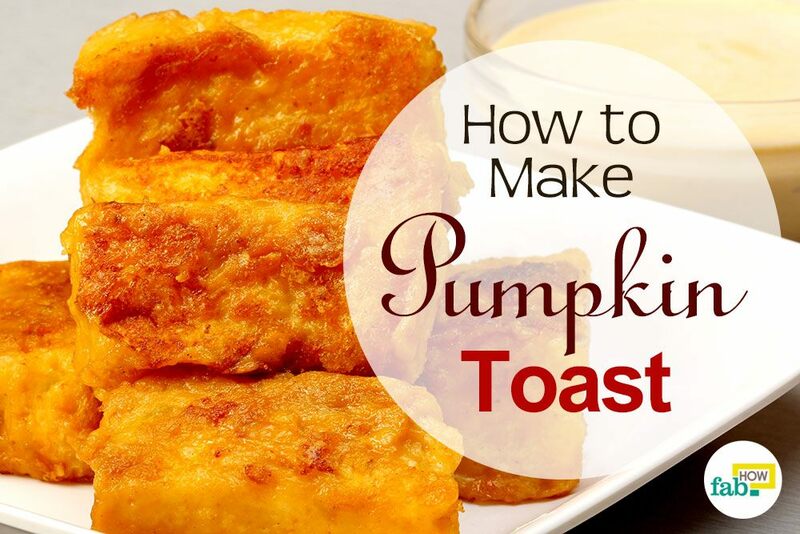 They will stay good for 30 to 45 days at room temperature in your pantry. The dried variety will stay good for even longer, almost up to 6 months. Drop the dates into a glass jar. Tightly screw on the lid. 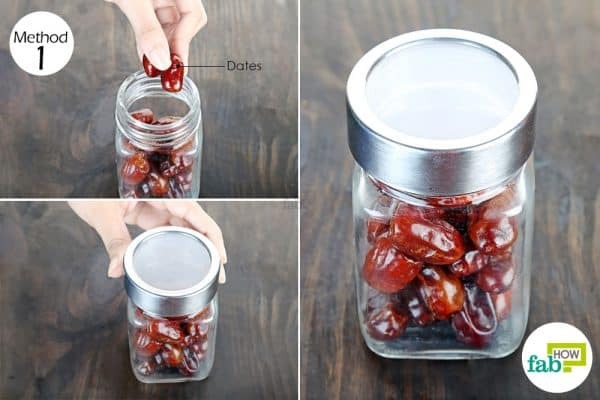 Store the jar in a corner of your pantry, away from direct sunlight. Also, do not store them near a stove, oven or any other heat source. Dates can stay good for almost 1 year when stored in the refrigerator. Refrigeration is most suited for fresh varieties like Medjool dates since they are not cured at the time of harvest. Storing them in the fridge helps retain most of their moisture and flavor. While the fresh varieties will stay good and fresh for 1 month when refrigerated, they will remain good enough to consume much longer, although you may notice a change in texture. The semi-dry and dry varieties can be refrigerated for up to 6 months or 1 year, respectively. Put the dates in a ziplock baggie. Squeeze out all the air from the bag and seal it. Flatten the bag to occupy less space and put it in your refrigerator until needed to store dates the right way. Fresh dates can last for almost 1 year in the freezer, while semi-dry and dry dates can surprisingly last for 2 to 3 years. The only thing that needs to be taken care of when freezing dates is ensuring that no air comes in contact with the fruit. The cold air in the freezer would dry them out and the dates would lose their creamy texture and rich flavor. 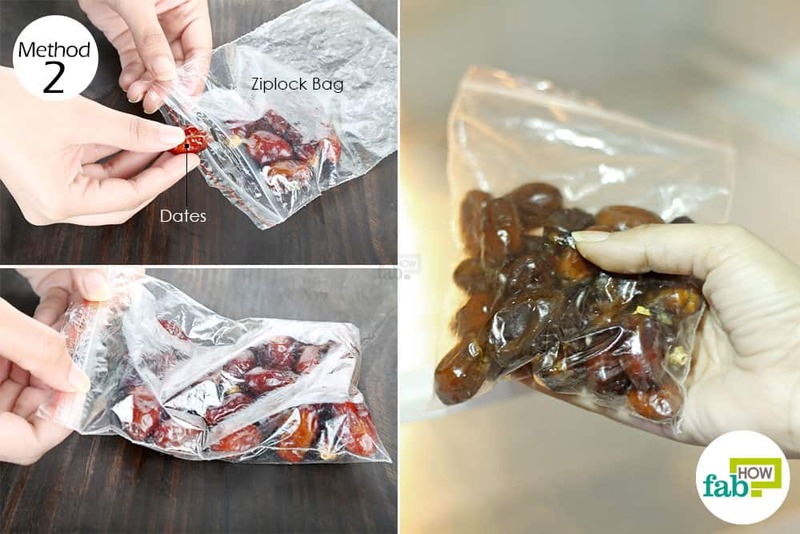 To prevent exposure to air, store the dates in an airtight container or a freezer-safe ziplock baggie. You can similarly freeze bell peppers and even lemons to extend their shelf life. Place the dates in an airtight plastic or glass container. The dates will expand upon freezing, so make sure to leave extra room in the container. Tightly secure the lid of the container. 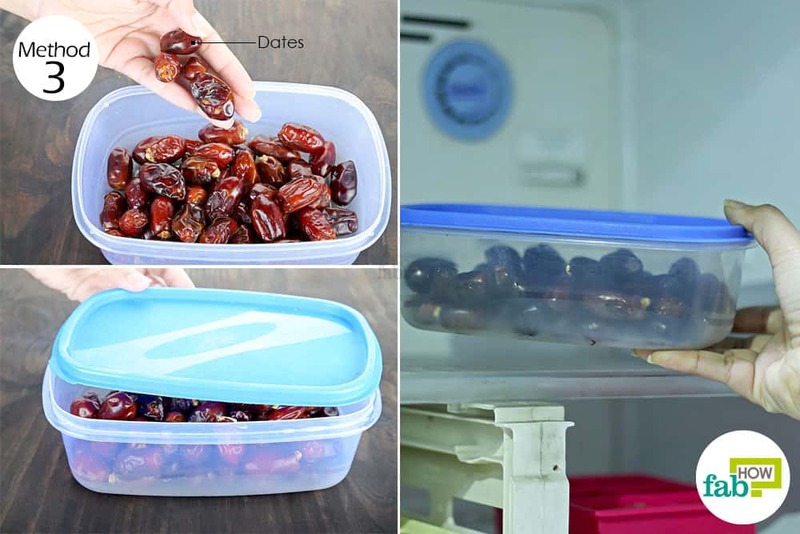 Pop it in your freezer to store dates for 1 to 3 years. To use frozen dates, you will need to thaw them first for 2 to 3 hours. Most packaged dates are already pitted. If they aren’t, use a sharp knife to cut them lengthwise and push out the pits from the dates. Frozen dates can be blended into a smoothie in place of conventional sweeteners. Simply soak them in water for 10 minutes, then blend them along with the other ingredients. Dates also are a welcome addition to oatmeal. Some dates may develop white spots on their skin. This happens when the sugar in the dates crystalizes. They are still safe to eat. If the patches bother you, warming up the dates on extremely low heat will melt away the sugar crystals. If the dates start giving off a rotten smell or show significant discoloration, discard them as they are likely spoiled. You can also use some of the methods described here to store mushrooms or to preserve sweet corn. If you have access to fresh dates from the tree, it is advisable to wash them first. Do make sure you pat them dry completely before freezing to avoid water crystals.